Tomasso Trattoria & Enoteca brings city style dining to the western suburbs with Tuscan inspired cuisine and an outstanding wine list. Visit our Tuscan Market & Wine Shop, Panzano Provviste e Vino, located just a few steps away. The perfect prelude to dinner, Panzano offers free wine tastings every Friday from 5 to 7 pm and Saturdays from 4 to 7 pm. The seasonally driven menu draws from every region of Italy with authentic dishes prepared simply, with the freshest ingredients. True to Italian tradition are our house made bread, pasta, desserts, and organic meats. 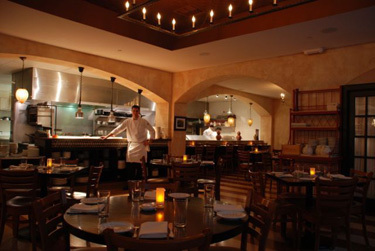 Tomasso's chic, rustic decor transports guests to Italy with a long white marble bar, chef's counter seating, and a panoramic open kitchen in the dining room. Tomasso is a wine lover's paradise with over twenty wines by the quartino, a unique wine list, and exciting wine dinners hosted by leading Italian wine makers. Visit our website to view our calendar of food and wine events. The private dining room, perfect for cocktail receptions, elegant dinners and business meetings, is equipped with wireless internet and a pull down presentation screen. Free event planning and custom menus available.